You signed in Premiata Montegranaro along with fomer NBA star Shawn Kemp. Many believed you would be an explosive duo in Italy, what happened? Why you left from the team early? Darius Rice: Playing with Shawn Kemp was Great we had a really good preseason in which i scored 48 points in 1 game. Shawn and i had the same agent. Shawn had to leave because of personal reasons with his family so he did not return. He was our main guy that everyone wanted to see so when he did not return the team released me. I was their best player. It was not my fault i like Premiata Monegranaro and the fand liked me too. I wish i was there to help them this year they really struggled. I could have led the to better record. You played for Cleveland Cavaliers in the NBA summer league, do you support them in the playoffs? Darius Rice: Yes i am supporting the Cavaliers. Really had a great relationship with them and Lebron and i are good friends. He saw a lot of good things in me and i wish i could have been on that team with them during this time. Hopefully this year i get back into NBA . They are a really good team with great chemistry and they have fun playing! Which well known NBA player you believe has your playing style? Darius Rice: I think my game is a combination. I have a Dirk Nowitzki game, with a mixture of Glen Rice and Robert Horry. You played in Asian leagues, whats your opinion about the competition there? Darius Rice: The Asian leagues are really competitive. The game is faster than the Euroleague game. It was a great experience as well. Also Puerto Rico was a really competitive league. I really liked the Italian league i think i would have been really good if the team stuck with me and i feel the team's record would have been better. Maybe i get to go back if i dont get NBA shot. 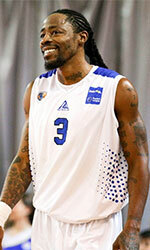 After your amazing game in the NBDL with Dakota Wizards did you have offers from European teams? Darius Rice: After the NBDL game i went to the Cleveland Cavaliers and also worked out with the San Antonio Spurs. I been through so much i can write a book of my experiences! It was really late in the season so Euroleague was about over. Hopefully i can get a good deal there in the future. Which league you would like to play in the future?